Aw, that’s great! 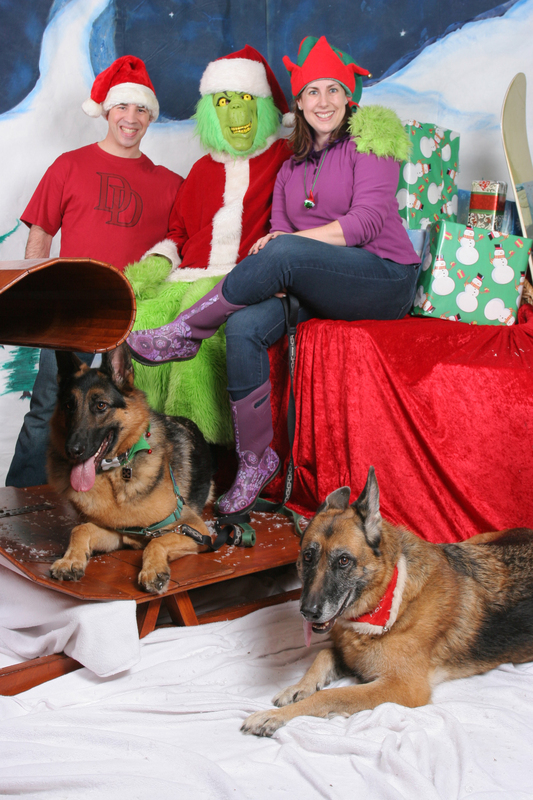 Where did you find photos with the Grinch?? Village Books in Bellingham, Wash. They do it every year, but I’ve been afraid Leo wouldn’t behave. I never should have doubted him! He modeled better than I did! What good dogs! I’m afraid that Roxy would have ran off and Jedi would have bitten the Grinch. I hope they got extra cookies for being so good. This is the first time I’ve ever seen that – very clever – WOOF! Now I need to find a Grinch so I can tie an antler to Mr. N’s head and have their picture taken together. Beautiful dogs – great photo. The Grinch is posing for Christmas photos?!? Now that is pawesome! Great photo! I hope this gets framed and put on the wall! This is one awesome photo! This inspires me to take a cool photo with Kayo! That Grinch didn’t scare you!? We were lucky he wasn’t scared of us!